When the Doctor Oz show encouraged people to come to the site and type in a ZIP code to discover water violations, the EPA site got busy fast. Since the site wasn't always available, I've placed the same widget here so you can check it at your convenience. Click here for a link to the Consumer Confidence Report. To find out if there have been any water violations in your area enter your zip code below. Walnuts, Rye, and what about the lowly tomato - A six-week study found that people with high-blood pressure who consumed two servings of canned tomato products daily experienced a significant decrease in blood pressure. Chocolate is the ultimate pleasure food, and good news – dark chocolate also has health benefits. The antioxidants in dark chocolate and cacao protect arteries and help them relax, thereby easing blood flow and lowering blood pressure (without increasing weight!). New York Times best selling author, Dr. Connie Guttersen suggests pairing dark chocolate with almonds. A dream team combo, Dr. Guttersen calls it, almonds and dark chocolate go perfectly together to provide an antioxidant boost as well as a hunger-suppressing sweet treat which means you get to indulge without overdoing it and packing on the pounds. 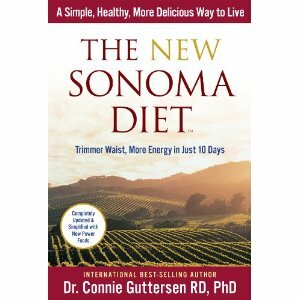 Dr. Guttersen’s newest book, The New Sonoma Diet, has the perfect recipe for incorporating this dream team combo into your diet. The Flourless Chocolate Cake calls for both dark chocolate and almonds as ingredients. Preheat oven to 325 degrees F. Spray a 9-inch round cake pan with a nonstick cooking spray. Line the bottom of the pan with parchment paper and spray again on top of the parchment paper. Place chocolate and butter in a bowl. Place over a pot of barley simmering water. Gently heat until the chocolate is melted. Whisk in yogurt and set aside. In a large mixing bowl, beat eggs and sugar with an electric mixer until thick and fluffy, about 4 minutes on high speed. Stir in salt and vanilla. Add nuts; then gently fold in chocolate. Do not overmix. Pour into prepared pan. Bake 30-35 minutes or until a toothpick inserted in the center of the cake comes out clean. Dust with powdered sugar and serve with ¼ cup of fresh seasonal fruit. Do not melt the chocolate over boiling water or the chocolate may scorch. Gentle heat is best, and stir periodically. Whip the eggs and sugar until light in color and full of air. This leavens the cake and gives it a light texture. Nutrition Facts per Serving: 207 calories, 5 g protein, 14 g fat (5 g saturated fat), 17 g carbohydrate, 4 g fiber, 63 mg cholesterol, 97 mg sodium, 5.8 glycemic load.